After I attended AnDevCon earlier this year I started working on a native Android app that solved one of my biggest needs: easily saving an article, video, or tweet to come back and read later. Most of the time this happens when I’m catching up on twitter while I’m [waiting in line at the grocery store, eating a quick snack, waiting for a meeting to start, etc.] – so I’m scrolling through the dozens of tweets in my timeline since the last time I checked when I see something that peaks my interest, but I know I don’t have time to read it now. In the past I would click the URL to open it in the browser, click home, then go back to twitter and keep going through my timeline. When I had time to go back I would open the browser and the article would be there. While that process works, it’s really not ideal. So I decided to create an application called “Later”. You can download the app from the Google Play store by clicking the link or scanning the QR code below. Understand the Payment System: Instead of having my app be free I wanted to see how the payment system worked, so I made the app $0.99. People are inherently against paying for apps, especially ones as simple as this one, but I’m really not interested in making money and want to explore how Google tracks payment, how I can transfer money, etc. Google’s documentation is phenomenal. If you’ve done any Android development before and have looked through developer.android.com, you know how detailed and helpful Google’s documentation is – it’s the same for publishing to the Play Store. During a BlueFletch Lunch & Learn on XCode: Prototyping with Storyboards, Rick showed us makeappicon.com, a great tool for creating all of the app icon sizes needed for the various app stores. 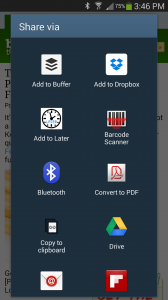 I used this to create all of the Google Play Store icons instead of having to manually create multiple files. When I had a small change to make, it took about 10 seconds to get all of the new files; if I had to manually recreate all file sizes again I probably would have just killed that idea. There’s already a ton of competitor apps out there that do the same or similar things. If I were creating this app for money-making purposes, I would have done much more extensive market research beforehand. 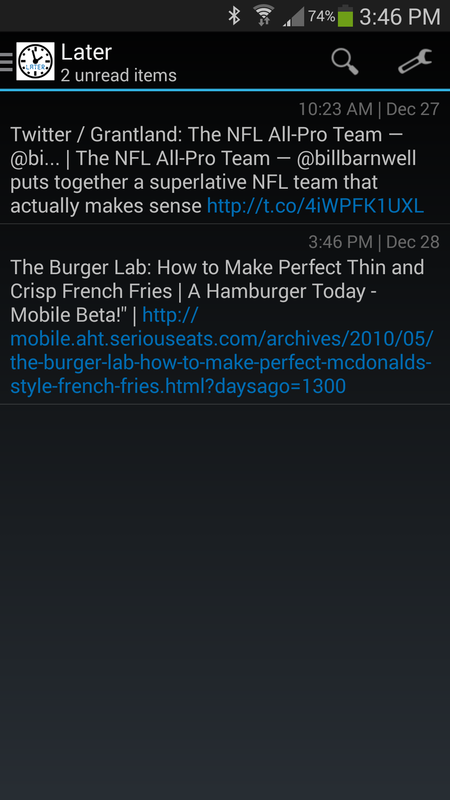 There’s a ton of “read it later” apps, most notably an app called Pocket (which was previously named “Read It Later”). Where I differentiate is that my app is very simple with a very limited scope of permissions access. Most of the other apps tend to be cloud services that offer synchronization across multiple devices. The statistics from the Play Store appear to only update once a day. My next step is to add Google Analytics to the app.